Wondering how to find candidates on Instagram? Discover the best tips for Instagram recruitment! In this blog post, you will learn how to effectively use Instagram to promote your employer brand and attract the best candidates for your open positions. You probably already have a social recruitment strategy that includes the LinkedIn, Twitter and Facebook, but what about Instagram? With over billion active users as of 2018, Instagram is one of the fastest-growing social media platforms, especially for users 18-34, who make up 61% of Instagram’s demographic. Its unique visual format offers a new way of storytelling, and it has been embraced by celebrities, brands, and even pets. How can Instagram be used in recruitment? Instagram has been particularly popular for companies; in fact, 80% of Instagram users follow a brand, and at least 30% have made a purchase based on something they’ve seen on Instagram. It’s clear that building your brand on Instagram works. However, using Instagram isn’t just effective for companies looking to sell products - it can also help you attract more qualified candidates and sell your open job positions. Social recruiting is definitely one of the top recruiting trends you should implement in 2019. ➡️ Download free eBook: 15 Recruiting Trends You Should Implement in 2019! Can Instagram really help you find great candidates? 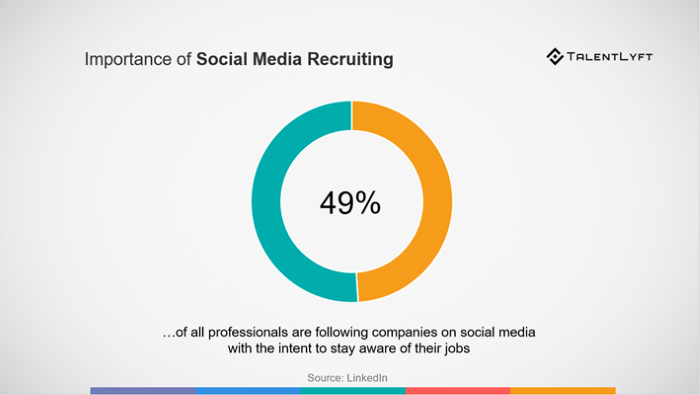 According to the LinkedIn survey, half of all professionals are following companies on social media with the intent to stay aware of their jobs. 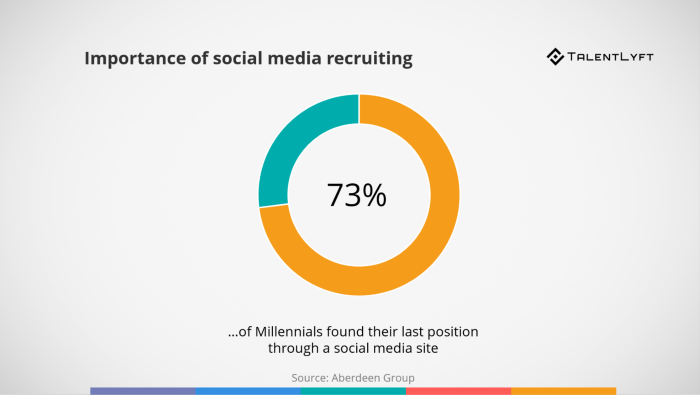 Aberdeen Group’s research has found that 73% of millennials found their last position through a social media site. First, you should learn how to promote your employer brand on social media. Second, you should plan your Instagram recruitment activities in accordance with your comprehensive social media recruitment strategy. Some brands choose to create a separate Instagram for their jobs, which can also be an option if you’re working for a larger company that does a lot of hiring. Having a distinctive look and feel to your Instagram is key when attracting candidates. Start with your Instagram bio. A great bio tells a follower who you are, what you offer, and one thing you want him or her to know about you. You can also include a link to your site (or to the jobs you offer) in your bio. Instagram also offers a “swipe for link” option, but it is only available to accounts with 10,000 or more followers. Even though it’s only a few sentences, your bio offers you a chance to show off your employer brand voice and make your company unique. Make sure that you also include an easy way for candidates to get in touch with you. Instagram’s visual format also makes branding important (since you’re using your images to tell a story), both in your individual pictures and in your feed overall. Using your brand colors can be a great place to start when establishing a specific look and feel. You’ll want to create consistency so that potential candidates will know what kind of company you are. It can be helpful to look at other brands and people on Instagram and see how they are organizing their content. If you want, you can also use apps like VSCO or Snapseed to edit your photos. The most successful brands and companies on Instagram are the ones who understand what their audience is looking for, which is why having a niche essential. When thinking about using Instagram for recruiting, you should have this same mindset. Consider the kind of talent you’d like to find - what do they like? What are they looking for? Who is your candidate persona? Using branded hashtags can be a great way to both engage your existing audience and find new audience members. Many people, including potential candidates, use hashtags to search Instagram and find new content, so being strategic about the hashtags you use can help you to attract candidates who are interested in what you do. 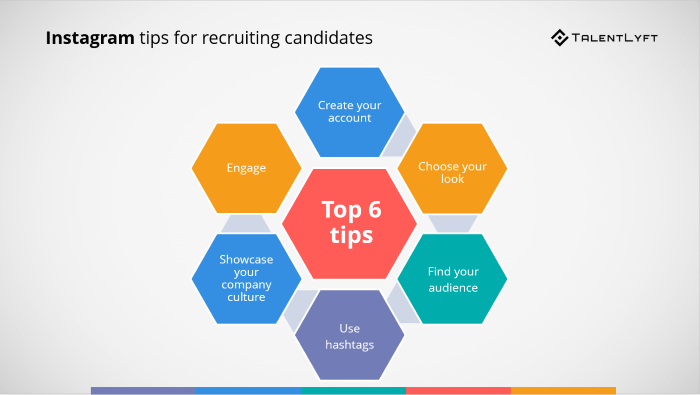 It will help to do some research beforehand to figure out the kinds of hashtags your candidate persona is using, so you’ll be able to better connect with your potential candidates. One of the best parts of Instagram is the ability for you to show the “behind the scenes” aspects of your company. Company culture is one of the most important parts of a new job to younger job seekers. Instagram makes the perfect platform to showcase your company culture and attract new talent. Instagram users value authenticity, so the more you can showcase what makes you unique, the better! Avoid using stock images, and make sure your images are sized correctly for Instagram. Think about what makes your company unique. Do you have amazing volunteer days? Do you have a company sports team? These are all great things to highlight, and will attract candidates who are interested not just in what you do, but will also be a good fit with your company. Instagram’s algorithm is designed to reward engagement by ranking posts higher in your followers’ feeds. The more people engage with your posts, the higher importance Instagram puts on them. However, this goes both ways - you can help drive engagement to your posts by interacting with the posts of others. You can also explore the more interactive features of Instagram like stories and story highlights to draw attention to your open positions, as well as the new IGTV feature. Make sure that you also respond to any candidate messages quickly as well. Using Instagram to find new talent does require some effort, but it’s possible to attract high-quality candidates who are already invested in your employer brand and company culture. Create a strong employer brand, use the right hashtags, and have a great feed, and you’ll be able to effectively use Instagram to find the best candidates for your open positions. Molly Powers is the Editorial Manager at Relode, a Nashville-based healthcare recruiting platform that uses the power of crowdsourcing to connect healthcare professionals to jobs.